That Classic Movie Life – I'm all about classic movies. I'm all about classic movies. I’ve been wanting to make a site like this for a while. I started on LiveJournal and moved on to Tumblr, but I decided it’s about time I grew up, so here I am! Later, I’ll try to make a few new posts a month as well! The Quiet Man is a Great film. A capital “G” great film that belongs in the canon of classic films. Released in 1952, it was added to the National Film Registry in 2013 and has become one of the most popular collaborations between John Ford and John Wayne. The film shines as an example of what happens when the direction, cinematography, score and casting of a film combine to make a beautiful picture. The story of a former American boxer returning home to his birthplace of Innisfree, the film offers a nostalgic look at a village stuck in the traditions of the past (much like Brigadoon, but without the time travel). John Wayne’s Sean Thornton is struck dumb at his first glance of Maureen O’Hara’s Mary Kate. The ultimate “feisty redhead,” Mary Kate is a “spinster” who lives with her older brother. They fall in love almost instantly, but, as in every good love story, there are multiple hurdles to overcome, the main one being winning the approval of her older brother. When Sean comes a’courtin’, their first “date” leads to one of the most iconic kisses ever captured on film. The two get married soon after, a sign of the old fashioned mentality of Mary Kate’s family. 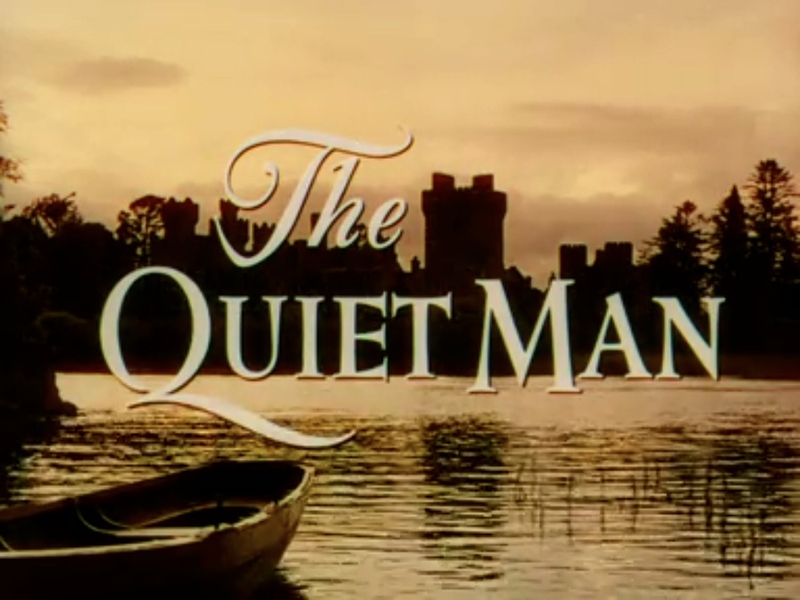 After a dispute over her dowry leads Mary Kate to deny her husband the more pleasurable aspects of married life, the entire film revolves around Sean’s efforts to get back the dowry. Of course, everything turns out all right in the end, with the film’s final shot implying that the two are going to make love the moment they walk through the door of their cottage. As in most of his films, John Wayne plays a version of himself. One of Hollywood’s biggest stars in 1952, John Wayne’s screen presence offers a familiar and comforting performance. His Sean Thornton is a man of secrets and regret, searching for solace in a more innocent world than the fighting rings he left behind. Maureen O’Hara steals the show, giving one of her finest performances. Beautifully costumed in bright reds, greens, and blues, she captures our attention at the same moment she captures John Wayne’s. She turns a character that could have been meek and annoying into a sort of heroine, chasing after what she wants and stubbornly refusing to give in no matter who stands in her way. The two have an on-screen chemistry beyond that of many screen pairings. Her energy, paired with his quiet nature, creates a classic combination that elevates the story and turns the film into a joy to watch. One of the most beautiful scenes in the film comes toward the end, when the “unhappy” couple returns home and reveals to each other that they both sought council from respected friends. As Sean pulls Mary Kate onto his lap, the light from the fire illuminates the pensive looks on their faces and gives a soft glow to the intimate image. 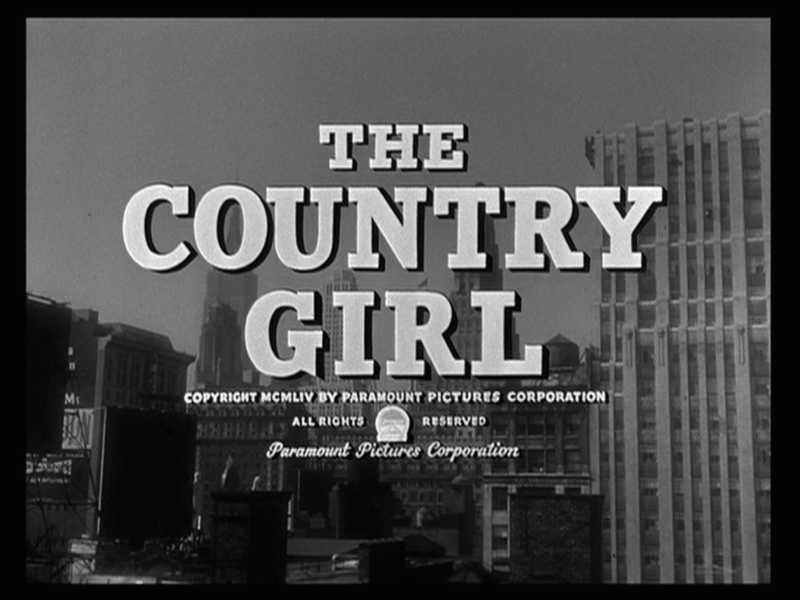 The Country Girl was the first Grace Kelly film I saw, and one I have watched many times. The film that won her an Oscar (upsetting Judy Garland’s outstanding performance in A Star Is Born), The Country Girl is a completely ordinary adaptation of a Clifford Odets’ stage play. A piece of Oscar bait if I ever saw one, the film still has a charm and a sophistication that allows it to (slightly) rise above other adaptations. The film’s saving grace comes from its actors. Bing Crosby, William Holden, and Grace Kelly give some of the best performances of their careers. The story of an aging, alcoholic stage actor trying to make a comeback with the help of his wife and director, The Country Girl follows the trio as they struggle through making a success out of a star on the decline. Bing Crosby’s Frank Elgin is tortured by the death of his son and his troubled marriage to Grace Kelly’s Georgie. William Holden’s Bernie Dodd is a Broadway director who tries to use Elgin in his new musical. A lifelong fan of Elgin’s work, Dodd believes he can turn him from a drunk back into a star. Hampered by guilt that is hidden behind a happy front, Frank lies and manipulates Dodd into believing that all his struggles and nerves are Georgie’s fault. Presented by Frank to be an overbearing and controlling wife, Georgie struggles to find her independence in a world where she feels trapped and confined by the men around her. Costumed expertly by Edith Head, Grace Kelly still shines in a role where she must appear as plain as possible. 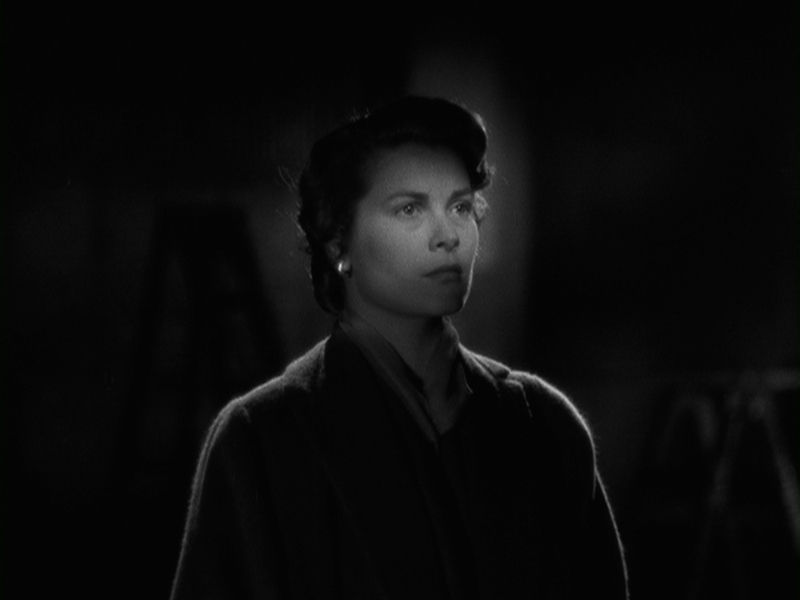 In a performance deserving of an Oscar (were it not for her opposition), Grace Kelly is stripped of all glamour except for a refreshing flashback sequence. One drawback to her performance is her upper class Philadelphia accent that is unsuited to her character’s background as the “country girl.” Georgie is an interesting character, and Grace Kelly brings “a poise and dignity that [is] ageless” to a crumbling woman. The “power behind the throne” as it were, Georgie sticks by Frank because of obligation and worry. Their marriage had fallen apart long before the film began, and we see it continue to worsen until a crisis pulls them back together. Georgie is clever and sarcastic, and Grace Kelly’s timing and attitude infuse her character with a strength that goes beyond the pages of the script. She has terrible romantic chemistry with Bing Crosby, which makes their crumbling marriage all the more real, and solid romantic chemistry with William Holden, which gives a depth to the characters’ interactions. In arguably his best performance outside of Sunset Boulevard, William Holden plays Bernie Dodd as both a sympathetic and arrogant character. Chauvinistic and misogynistic, Bernie is easily convinced by Frank’s lies about Georgie. Opposite Bing Crosby, William Holden injects just the right amount of hero worship and savior complex into Bernie’s character. 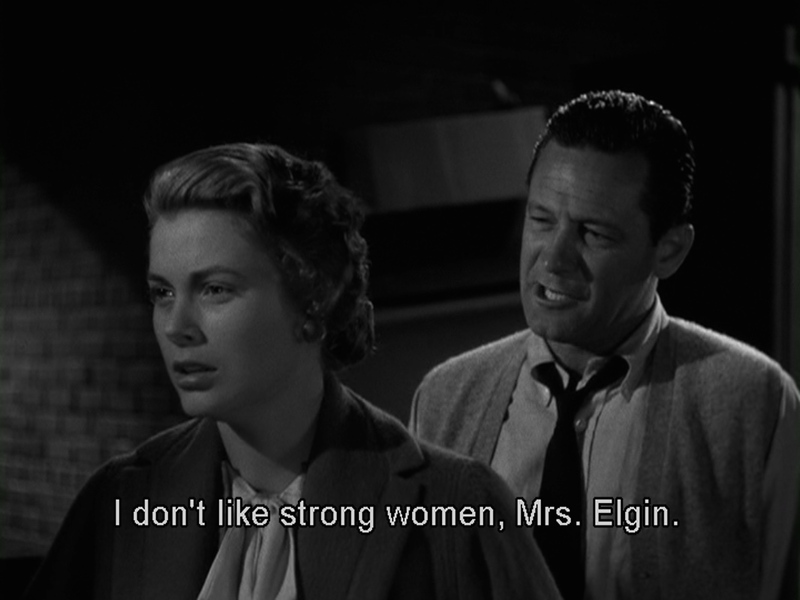 While on screen with Grace Kelly, the character’s sexist and bitter side comes out in full force: “I don’t like strong women, Mrs. Elgin.” William Holden’s charisma rises above the boorish character and turns Bernie Dodd from a disgusting jerk into a nearly sympathetic man with a wounded past. Bing Crosby excels in a rare dramatic role that stretches his talent to the limits. He’s “acting” in nearly every scene and he really manages to capture the sense of who Frank Elgin has become. Frank is an actor in every aspect of his life – he lies to Georgie, he lies to Bernie, and, most importantly, he lies to himself. 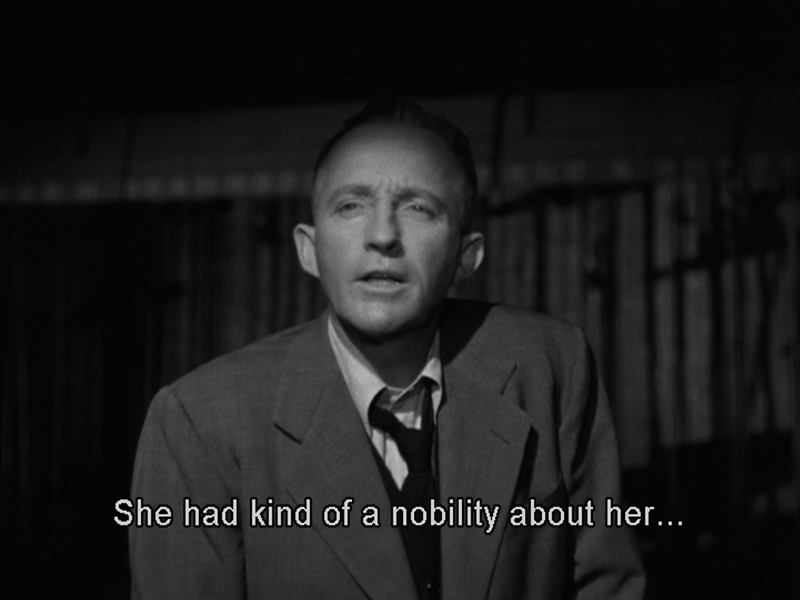 The film also takes advantage of Bing Crosby voice and uses it well. It would, however, been interesting to see him attempt a role with no singing at all (similar to Frank Sinatra’s excellent performances in From Here to Eternity or The Manchurian Candidate). Overall, The Country Girl is a moderately interesting take on the usual behind-the-scenes of the theater film. Lacking the depth of All About Eve or the excitement of a film like The Band Wagon, The Country Girl is an example of the performances overshadowing the plot, perhaps to the detriment of the story. With an exhausting number of angry monologues and previews of what looks like a terrible musical they’re trying to make, the film never rises to the heights that it could have.